IFLA is revising the International Cataloguing Principles and asked for input. Although I doubt that it will have an effect, I did write up my comments and send them in. Here's my view of the principles, including their history. The principles here stated apply only to the choice and form of headings and entry words -- i.e. to the principal elements determining the order of entries -- in catalogues of printed books in which entries under authors' names and, where these are inappropriate or insufficient, under the titles of works are combined in one alphabetical sequence. The basic statement of principles was not particularly different from those stated by Charles Ammi Cutter in 1875. Note that the ICP does not include subject access, which was included in Cutter's objectives for the catalog. 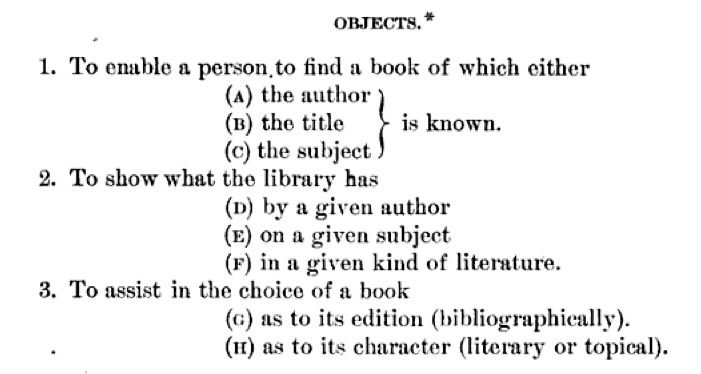 Somewhere between 1875 and 1961, cataloging became descriptive cataloging only. Cutter's rules did include a fair amount detail about subject cataloging (in 13 pages, as compared to 23 pages on authors). The next version of the principles was issued in 2009. This version is intended to be "applicable to online catalogs and beyond." This is a post-FRBR set of principles, and the objectives of the catalog are given in points with headings find, identify, select, obtain and navigate. Of course, the first four are the FRBR user tasks. The fifth one, navigate, as I recall was suggested by Elaine Svenonius and obviously was looked on favorably even though it hasn't been added to the FRBR document, as far as I know. It's worth pointing out a couple of key changes. The first is the statement "as the result of a search..." The 1961 principles were designed for an alphabetically arranged catalog; this set of principles recognizes that there are searches and search results in online catalogs, and it never mentions alphabetical arrangement. The second is that there is specific reference to relationships, and that these are expected to be searchable along with attributes of the resource. The third is that there is something called "secondary limiting of a search result." This latter appears to reflect the use of facets in search interfaces. Although the ICP talks about "find," etc., it doesn't relate those actions to the form of the "authorized access points." There is no recognition that searching today is primarily on keyword, not on left-anchored strings. The 2015 ICP includes among its principles that of accessibility of the catalog for all users. Accessibility, however, is primarily a function of the catalog technology, not the content of the catalog data. It also recommends (to my great pleasure) that the catalog data be made available for open access. This is another principle that is not content-based. Equally important is the idea, which is expressed in the 2015 principles under "navigate" as: "... beyond the catalogue, to other catalogues and in non-library contexts." This is clearly a function of the catalog, with the support of the catalog data, but what data serves this function is not mentioned. This mainly refers to the inclusion of the elements that serve as limiting facets on retrieved sets. None of the elements listed here are included in the ICP's instructions on "authorized access points," yet these are, indeed, access points. Uncontrolled forms of dates, places, content, carrier, etc., are simply not usable as limits. Yet nowhere in the document is the form of these access points addressed. There is undoubtedly much more that could be said about the principles, but this is what seemed to me to be appropriate to the request for comment on this draft. holistic technologies and prescriptive technologies. In the former, a practitioner has control over an entire process, and frequently employs several skills along the way...By contrast, a prescriptive technology breaks a process down into steps, each of which can be undertaken by a different person, often with different expertise. It's the artisan vs. Henry Ford's dis-empowered worker. As we know, there has been some recognition, especially in the Japanese factory models, that dis-empowered workers produce poorer quality goods with less efficiency. Brown has a certain riff on this, but what came immediately to my mind was the library catalog. The library catalog is not a classic case of the assembly line, but it has the element of different workers being tasked with different aspects of an outcome, but no one responsible for the whole. We have (illogically, I say) separated the creation of the catalog data from the creation of the catalog. In the era of card catalogs (and the book catalogs that preceded them), catalogers created the catalog. What they produced was what people used, directly. 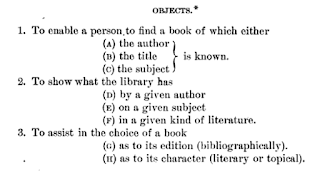 Catalogers decided the headings that would be the entry points to the catalog, and thus determined how access would take place. Catalogers wrote the actual display that the catalog user would see. Whether or not people would find things in the catalog was directly in the hands of the catalogs, and they could decide what would bring related entries within card-flipping distance of each other, and whether cross-references were needed. The technology of the card catalog was the card. The technologist was the cataloger. This is no longer the case. 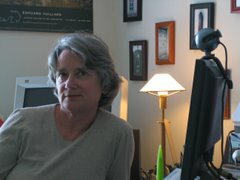 The technology of the catalog is now a selection of computer systems. Not only are catalogers not designing these systems, in most cases no one in libraries is doing so. This has created a strange and uncomfortable situation in the library profession. Cataloging is still based on rules created by a small number of professional bodies, mostly IFLA and some national libraries. IFLA is asking for comments on its latest edition of the International Cataloging Principles but those principles are not directly related to catalog technology. Some Western libraries are making use of or moving toward the rules created by the Joint Steering Committee for Resource Description and Access (RDA), which boasts of being "technology neutral." These two new-ish standards have nothing to say about the catalog itself, as if cataloging existed in some technological limbo. Meanwhile, work goes on in bibliographic data arena with the development of the BIBFRAMEs, variations on a new data carrier for cataloging data. This latter work has nothing to say about how resources should be cataloged, and also has nothing to say about what services catalogs should perform, nor how they should make the data useful. It's philosophy is "whatever in, whatever out." Meanwhile #2, library vendors create the systems that will use the machine-readable data that is created following cataloging rules that very carefully avoid any mention of functionality or technology. Are catalog users to be expected to perform left-anchored searches on headings? Keyword searches on whole records? Will the system provide facets that can be secondary limits on search results? What will be displayed to the user? What navigation will be possible? Who decides? The code4lib community talks about getting catalogers and coders together, and wonders if catalogers should be taught to code. The problem, however, is not between coders and catalogers but is systemic in our profession. We have kept cataloging and computer technology separate, as if they aren't both absolutely necessary. One is the chassis, the other the engine, but nothing useful can come off the assembly line unless both are present in the design and the creation of the product. It seems silly to have to say this, but you simply cannot design data and the systems that will use the data each in their own separate silo. This situation is so patently absurd that I am embarrassed to have to bring it up. Getting catalogers and coders together is not going to make a difference as long as they are trying to fit one group's round peg into the others' square hole. (Don't think about that metaphor too much.) We have to have a unified design, that's all there is to it.